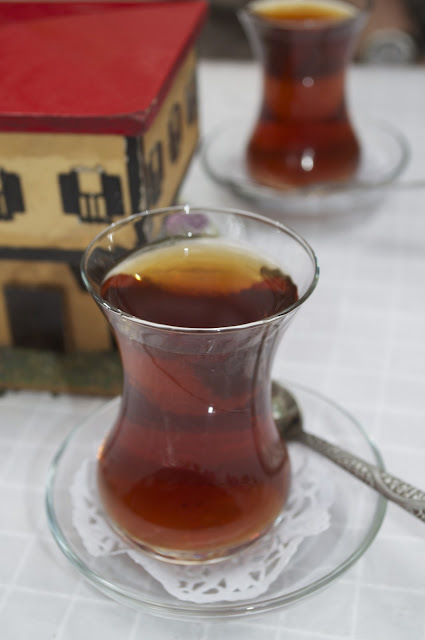 One of the many things that A and C loved about their trip around Eastern Turkey was the tea - and we're not talking the tourist-trap apple stuff. Oh no. We're talking real tea. For C, the day doesn't start without a cuppa (very strong, two sugars and just a dash of milk), and so it was was great pleasure that she quickly discovered Turkey's unique tea culture. A can usually take or leave tea, preferring to kick his day off with a coffee - but even he developed a weakness for the stuff during our time in Anatolia. It's that good. Turkey is actually a pretty large producer of tea, with the mountains of the north east near Rize providing excellent conditions for the plant's cultivation. The climate's mild and humid here, and the shrub thrives on the foothills by the sea - driving through the winding paths on hair-raising roadtrips, rows and rows of tea plantations grow on the mountainsides as far as the eye can see. Traditionally, women undertake the backbreaking task of picking the delicate leaves off the plants and in season many women can be seen plucking leaves off the plants before the stuff's transported for processing. Sadly, most of the vast quantities of harvested tea never leave Turkey, as domestic demand is so high that it all but outstrips supply. This is a real shame because, generally speaking, the quality's very good, and certainly better than the traditional English builder's tea. C, the massive tea drinker she is, pointed this out on more than one occasion. 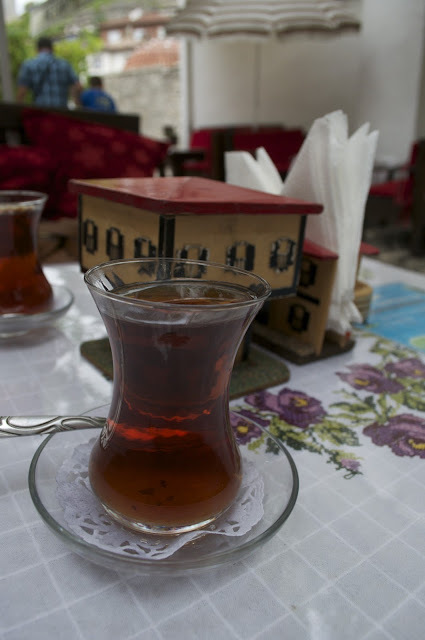 Visit anywhere outside of the tourist traps, and it's not difficult to see why so little Turkish tea makes it out of the country: locals take any excuse for a tea break, and it accompanies all kinds of social interactions. Breakfast, lunch and dinner are all accompanied by tea, and it's used as a social lubricant as well as something to simply pass the time. Where it's available to buy, tea is extremely cheap (a few pence per cup) and often it's available for free. By way of example, A and C were sitting in a bus company office at the end of the earth (not a huge exaggeration) in Kars waiting for our ride. As the bus delay got longer (common in Anatolia - we once waited in a Trabzon bus terminal for several hours for a delayed bus, but happily made a collection of friends who kept assuring us that the bus would come, no problem - "problem yok"), we were plied with tea by the staff. While it may have been done in part to placate us, tea drinking is just part of everyday culture here - even customers who had buses arriving on time were served more than their fill of tea as they waited. Tea is deeply ingrained in the culture here, in a way that's strongly reminiscent of the Southern Cone's culture of yerba mate. Even if you don't have a taste for Turkish tea when you first arrive in Anatolia, you better make sure you develop one pretty quickly - it's not really the 'done thing' to decline an offer for a cup of Çay and certainly, by the time you get out to Eastern Anatolian around Trabzon, Kars and down further to Van and beyond, it could easily cause offence if you repeatedly decline offers from locals. The tea itself is black (although as the pictures show it comes out a russet red) and is made in a samovar, a method of tea imported from Russia. A samovar is essentially a stove-top contraption made of a pair of tea pots: the larger teapot underneath contains simmering water, while a small one above contains a highly concentrated tea. A small amount of the tea concentrate is poured through a strainer into the bottom of a tulip-shaped glass and diluted using the water from the large pot. Turks also have a pretty bit sweet tooth and a 125ml teacup is usually sweetened with one or two large sugar lumps to finish (this appeals to C's sweet tooth). A small Turkish samovar will easily produce 15 to 20 cups of tea and keep people going for a good couple of hours. Refills are pretty easily done, by adding more water (and tea leaves as necessary) to the two pots, meaning you can go all day with the samovar if you really want to. 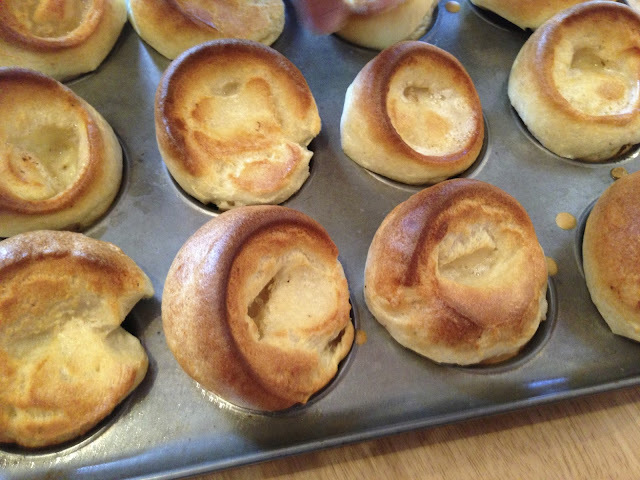 Turks often do, leaving it on for hours to simmer. And, briefly, a word of warning about the apple tea that so many western visitors enthuse about when they return from a trip to tourist-heavy Turkey: there's a reason that only tourists drink it. While people will try and sell you 'apple tea' in the Southwestern areas of Turkey and in Istanbul, it's hardly traditional, and is essentially just a granular form of concentrated apple juice produced specifically for the tourist market. When C was buying jewellery at the Grand Bazaar in Istanbul, she was offered a choice of black or apple tea when she entered into negotiations - a customary practice in Turkey, where, like in the UK, everything is discussed over tea. When the proprietor found out where we'd been immediately before Istanbul (that is to say, all over the depths of Anotolia), he apologised profusely for even asking, and had the tea boy run off through the Bazaar to bring us some black tea immediately; he knew we'd seen enough of the culture to be in the know. 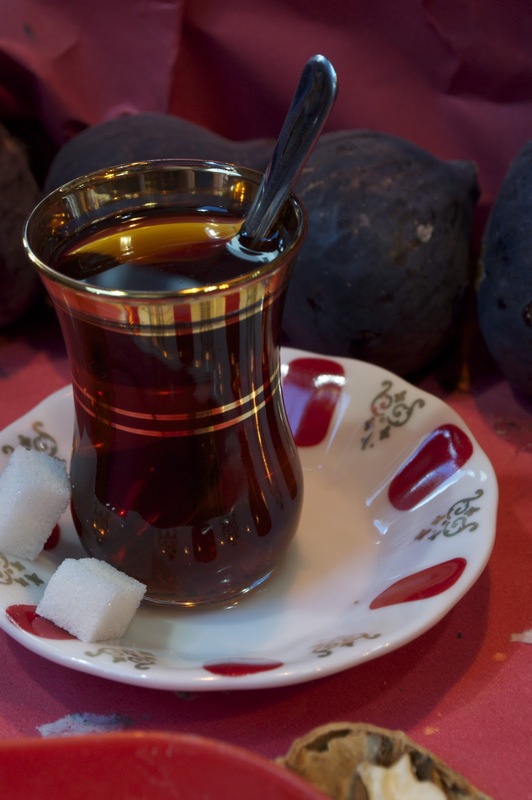 Dark tea: tea in Turkey is drunk "dark" or "clear"
Many other teas are on sale in the Bazaars of Istanbul, but the only real stuff is the black tea from Rize. 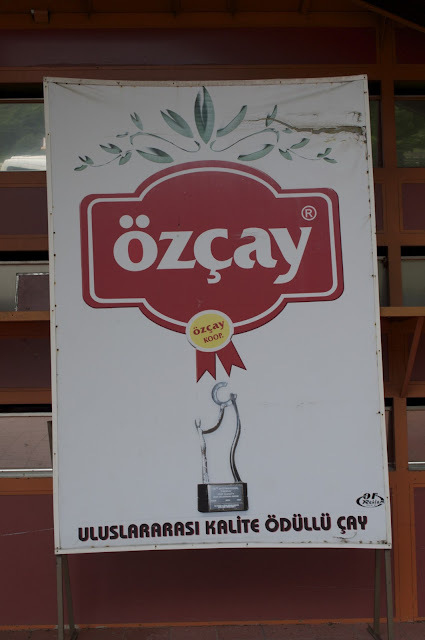 The biggest player in the market is the state-owned Çaykur, though other brands such as Özçay and Doğadan are also easily found. 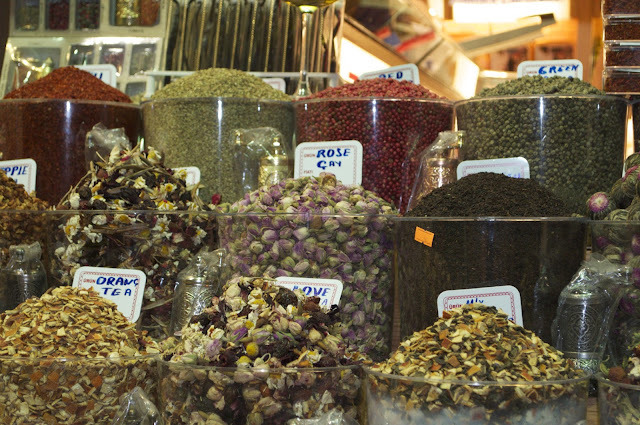 By way of translation, the title of this post means "Two teas, please" in Turkish.